What does one do after a 2 hour class ? Why, succumb to a fellow foodie’s siren calls and eat cake of course! 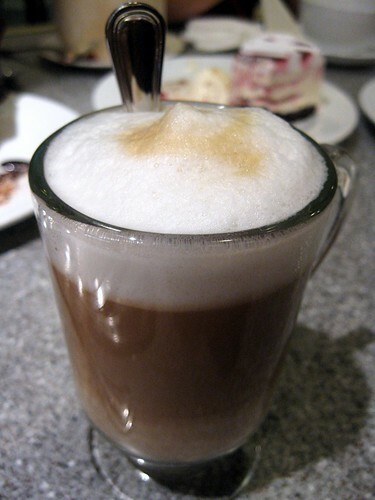 Cake a la mode with a cafe latte to match. Cake was yummy but unfortunately the coffee was not very memorable. I cannot remember the price though. I believe it was about $4.00 though, a bit on the pricey side. 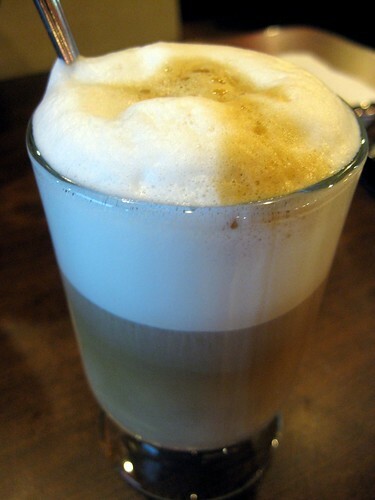 But the following cafe latte is quite memorable. Smooth and done at just the right temperature. 🙂 Extra points as they didn’t charge extra for the skim milk. ❤ Yum at about $3.50. Next Post → Where are the other Smurfettes? Let me guess……. the first pic is from Charcoal & the 2nd from CheezBox? 100 points! 😀 U recognise their table tops?